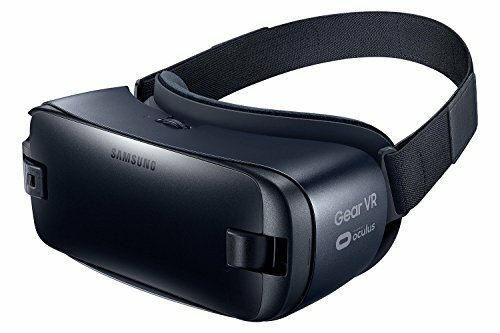 Take your adventures with you - The Gear VR turns your Samsung Galaxy smartphone¹ into a completely portable and wireless virtual reality machine by snapping your phone into the headset. The immersive Super AMOLED screen plus a powerful processor create vivid surroundings and movements so realistic, you’ll feel like you’ve been dropped right into the center of the action. Turn your compatible Samsung Galaxy smartphone into a completely portable and wireless virtual reality machine, with Accelerometer, Gyrometer, Proximity (Mount/Unmount Detection). Easy to use touch pad with dedicated Back and Home Buttons. Wide field of view, precise head-tracking and low latency brings reality to the virtual, Be transported to amazing new worlds, in games, video and images, Thousands of 360 degree panoramic photos. Compatible with: Samsung Galaxy S7, Galaxy S7 edge, Galaxy Note 5, Galaxy S6 edge+, Galaxy S6 and Galaxy S6 edge (International Version - Product packaging and manual may be in a different language other than English).